Canadian design studio Moss & Lam rediscovered a traditional craft process to create this collection of patterned side tables. The scagliola technique dates back to the 17th century, and involves combining plaster, pigment and glue to create a faux-marble surface. According to the studio the process was once considered "a poor man's alternative to precious stone", although over time has come to be valued more. "The almost alchemic transformation of simple substances – water, glue, pigment and plaster – results in a striking surface, especially when applied to W1's contemporary shapes," said the studio. 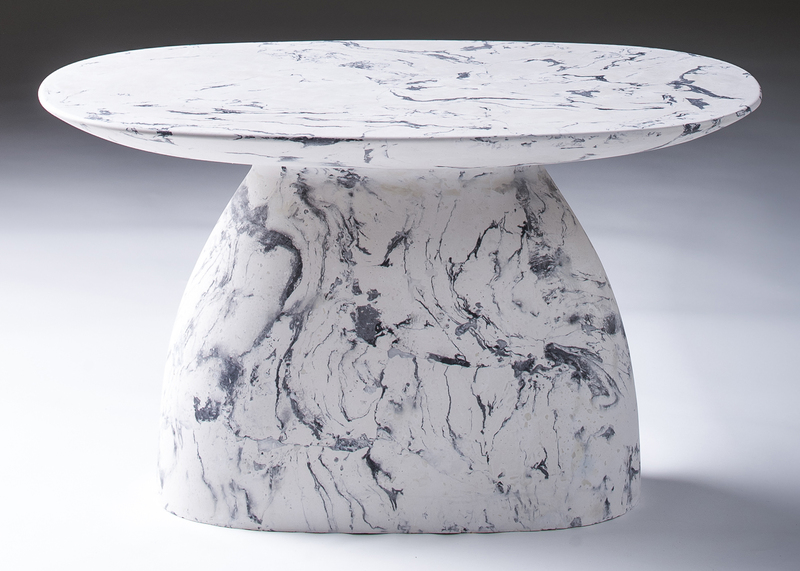 The W1 tables come in three sizes, each shaped like an upturned Grecian urn. The surface of the furniture is covered in swirled patterns, with glimpses of bright yellow showing through the black table, and veins of grey and black in the two white versions. The studio apparently based the shapes of the furniture on the streets and architecture of London's west end. The tables are named after Dover Street, Dean Street and Mount Street to evoke "a walk along some of the elegant stretches of London's central W1 district". Moss & Lam was founded in 1987 by Deborah Moss and Edward Lam, who passed away in 2013. The studio has previously designed large-scale installations for various hotel chains around the world, but the W1 tables are part of Moss' renewed focus on furniture. British designer Sebastian Cox has also highlighted the ways neglected craft techniques can offer new opportunities for design, and several other designers have created pieces using traditional methods. Austrian designer Thomas Feichtner worked with master carpenters to create his minimal A-chair, and Bosnian brand Zanat released a stool decorated in "tattoos" of hand-chiselled carvings.